Before registering for a doctoral program, doctoral candidates must receive approval from a dissertation supervisor authorized to direct research and be hosted by a research team/unit within a doctoral school accredited or jointly accredited by PSL. Admissions criteria are determined by each doctoral school. 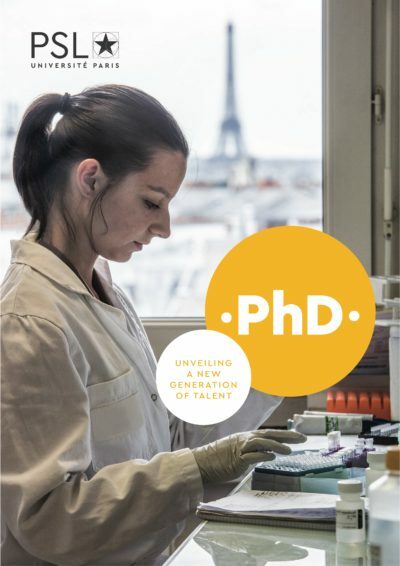 The director of the doctoral school confirms that the applicant meets the scientific, material, and financial conditions required for the research to be successful. “Enrollment in the first year of a doctoral program is decided by the head of the institution based on a recommendation by the director of the doctoral school, who has been advised by the dissertation supervisor and the director of the research team or unit on the quality of the project and conditions for carrying it out. Enrolled students are admitted to the courses offered by the doctoral school. Enrollment for the first year generally takes place between September 1 and mid-December of the current year. Exemptions may be granted according to the rules in effect within dissertation preparation institutions. Students must re-enroll each year. For doctoral candidates enrolling online using the ADUM (PhD Connect) platform, the documents related to enrollment/re-enrollment procedures are available in the resources section. From the academic year 2018-2019, you will have to pay the Contribution Vie Etudiante et de Campus (CVEC) before your enrollment in your thesis preparation institution. Its amount for the year 2018-2019 is set at 90€. The acquittal of the CVEC is done at the beginning of each academic year. For more information and conditions of exemption, consult the FAQ of the website dedicated to CVEC payment ! Consult also the Décret related to CVEC by clicking here. A partnership between PSL University and the SIUMPPS (Interuniversity Service of Preventive Medicine and Health Promotion) is set up to allow students enrolled in PSL to benefit from preventive medicine actions SIUMPPS. specialized prevention and health promotion actions, at the student’s request or at the discretion of the professional who receives it during the interview. Medical appointment, for the general prevention interview, is done individually, online on www.doctolib.fr, establishment “SIUMPPS Paris Descartes, Centre de médecine préventive” and specialty “Médecine préventive”.